The majority of desktop buyers are doing software installs on CPI basis, which means they are quite limited in targeting options. Some of them are not willing to buy users on older machines, as the offer itself wouldn’t be able to convert. If your offer is dictating your targeting, there is no point in purchasing traffic with no potential installs, right? We have all been there, we have heard you. 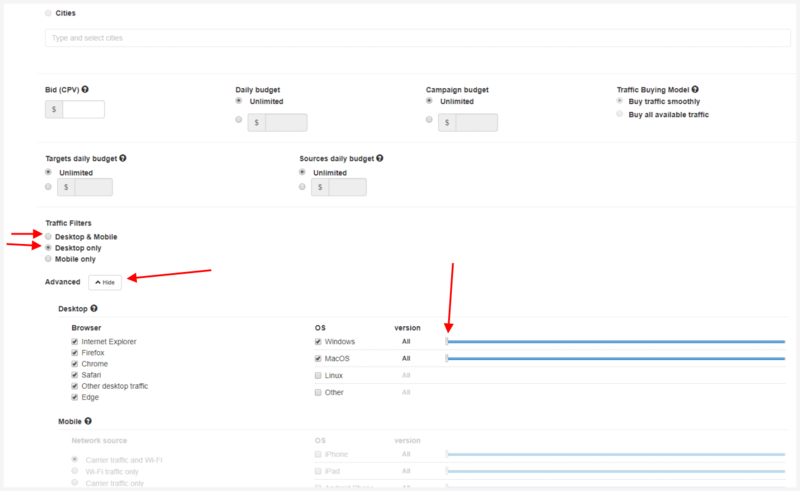 So we launched Desktop OS Version Targeting for new and old campaigns to help you optimize towards your CPI quotas. Following latest trends in the US, this tool will allow you to tune your campaigns and cut down ad spend, meaning you will make more money per install. This feature is also useful for promoting applications and toolbars dedicated to the newer operating systems. So, how to use this useful tool? Select the Advanced option in the Traffic Filters section. Select the lowest required version on the slider for a given operating system. The traffic will come from chosen version of the OS and higher. You can choose the settings for multiple operating systems. Zeropark Note:Currently, the OS Version Targeting are available for Windows and Mac. Keep in mind that the narrower your targeting is, the higher will be the traffic cost & lower the volumes of traffic available, so don’t forget to revize your bidding strategy and do your homework – get the landers right!